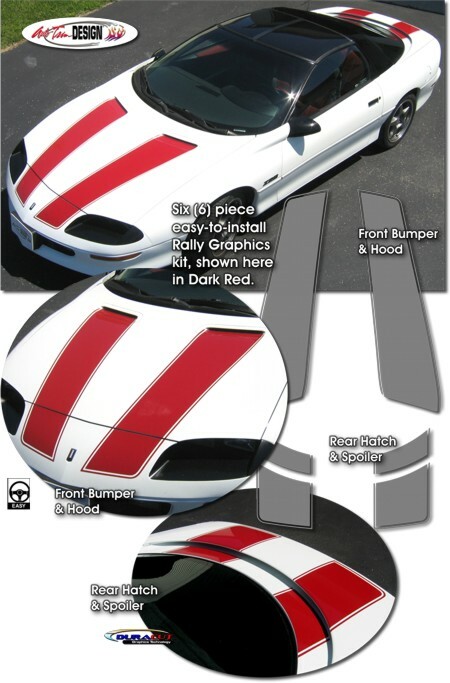 Make your '93-'97 Chevrolet Camaro or Z28 tough looking with this easy-to-install six (6) piece Rally Stripe Graphics kit. This stripe package is not just a set of 12" (30.48cm) straight strips in a box. Our graphic kit consists of prefitted and contoured pieces with a classic .28" (7.14mm) pinstripe border as shown in the illustration. These kits are specifically made for the '93-'97 Chevrolet Camaro/Z28 with factory Hood and Spoiler as shown and will not fit any other vehicle. Stripe package is manufactured for a center spacing as per our Parts List at time of installation. Front Bumper & Hood pieces require slight trimming at Bumper and Vent areas after installation. Trimmable Hood Vent Extension Kit #ATD-CHVCMROGRPH121 consists of two (2) pieces 12" (30.48cm) in length that can be trimmed during installation for applications where stripe extension between the factory Hood Vent and Windshield is desired.